With the holiday shopping frenzy fast approaching, we’re here with our Q4 2016 Best Android Smartphones guide. Perhaps the biggest news since we updated our guide last quarter is the demise of Samsung’s Galaxy Note7. After an alarming number of phones caught fire early-on, Samsung initiated a global recall and exchange program, believing it isolated the problem to a single battery supplier. Unfortunately, the supposedly safe replacements started catching fire too. Unable to determine the root cause behind the phone’s battery fires, Samsung decided to halt production and sales of its flagship phablet permanently. RIP Note7. Over the past month or so, we’ve taken a close look at several new Android phones. Huawei’s Honor 8 and Motorola’s Moto Z Play Droid both cost around $400 and provide some competition for the OnePlus 3, our mid-range selection in Q3. We also reviewed the Pixel XL, the larger of Google’s two new Pixel phones, and while it has an excellent camera; a smooth, pristine Google software experience, which includes the new Pixel Launcher and Google Assistant; and the promise of timely software updates, we were disappointed by its performance and lack of features considering its steep price; however, if your priorities are different than ours, you may find it holds a higher value. There’s a lot of options to choose from when shopping for a phablet considering the disproportionate number of Android phones having a screen size of 5.5-inches or larger. A number of these fall into the mid-range category, which we cover below. For people living outside of North America there are even more, usually less-expensive, options to consider too. But for this pick, we’re sticking with globally-available flagships. Our previous pick, Samsung’s Galaxy Note5, is still the top of the Note range because of the Note7’s early retirement. Despite its age, it’s still a great phone. Its 5.7-inch 2560x1440 SAMOLED display is still one of the best available, with excellent black levels, reasonably good brightness, and several different display modes ranging from a very accurate sRGB mode to a couple of wider gamut modes with more vivid colors. Its 16MP rear camera with PDAF and OIS is also very good. The Note5’s Exynos 7420 SoC may not top the performance charts anymore, but it’s still plenty quick, and the 4GB of LPDDR4 RAM gives Samsung’s memory hungry TouchWiz UI some extra room to work. 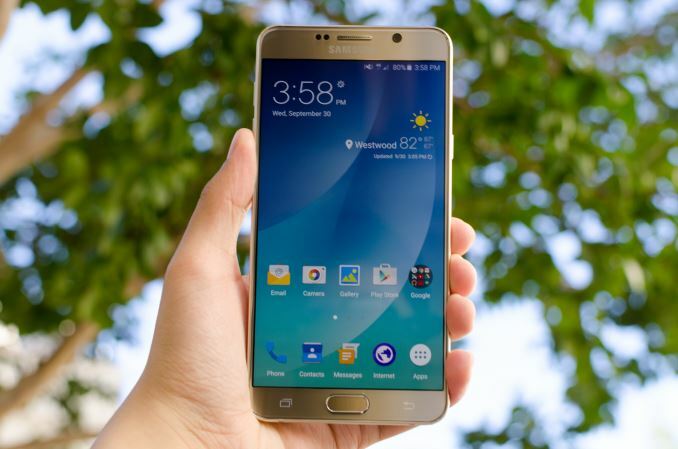 Speaking of TouchWiz, it still has some questionable design elements, and it suffers from some performance hiccups that make the UI feel less fluid, but it does include some useful phablet features, including the ability to shrink the whole screen by pressing the home button three times, the option to use a smaller keyboard for one-handed thumb typing, and the two-pane Multi Window feature that allows you to work in two apps at the same time. There’s also the S-Pen and the additional functionality it provides, just do not stick it back into its silo backwards or you’ll have to break the phone to get it back out. For those looking for a more modern choice, or who want a slightly smaller phone, there’s Samsung’s Galaxy S7 edge, with its 5.5-inch 2560x1440 SAMOLED display that’s every bit as good as the Note5’s. Its 12MP rear camera with OIS and an f/1.7 aperture captures great pictures, especially in low-light, and the improved phase detect autofocus (PDAF) is the best available. Battery life is also quite good thanks to a 3600mAh battery. The rest of its hardware and features are shared with the smaller Galaxy S7, including IP68 dust and water protection and wireless charging. 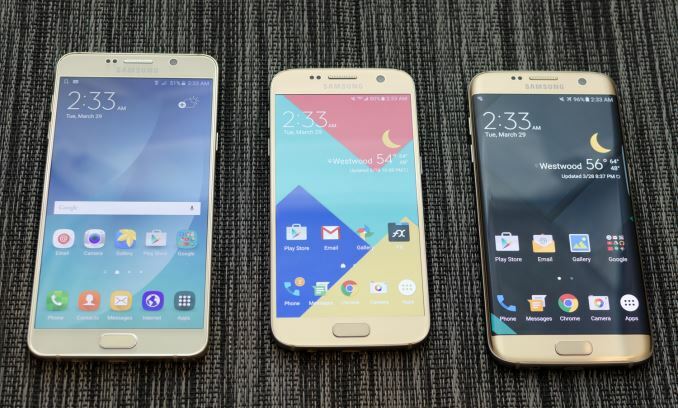 Earlier this year, Samsung released its seventh generation Galaxy S series. 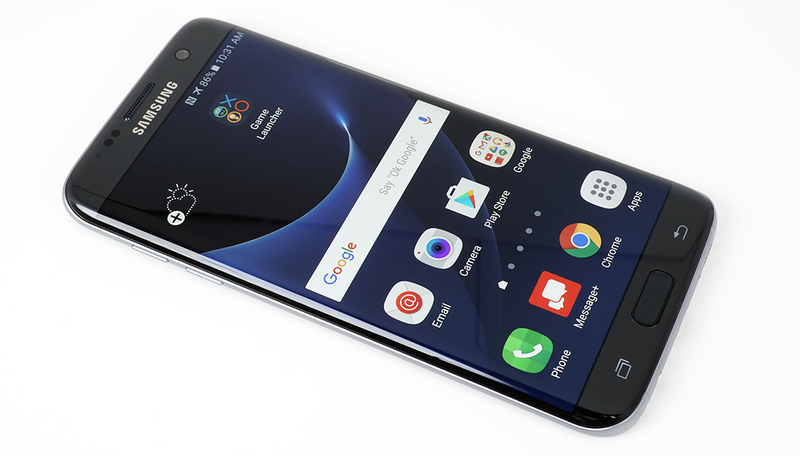 The Galaxy S7 improves upon the design and features of the popular Galaxy S6. The design is very similar, but Samsung has tweaked the curvature of the back, edges, and cover glass to make the phone significantly more ergonomic. The chassis does get thicker and heavier, but this allows for a significant reduction to the camera hump and an increase in battery capacity. As far as specs go, the Galaxy S7 comes in two versions. Both have 5.1-inch 2560x1440 SAMOLED displays, 32GB or 64GB of UFS 2.0 NAND, 4GB of LPDDR4 memory, a 12MP Sony IMX260 camera with a f/1.7 aperture, and a 3000mAh battery. Depending on where you live you'll either get Qualcomm's Snapdragon 820 or Samsung's Exynos 8890 SoC, both of which use custom ARM CPU cores. More specifically, the US, Japan, and China versions receive Snapdragon 820, while the rest of the world gets Exynos 8890. Regardless of which Galaxy S7 you get, you'll be getting the best hardware that Samsung has to offer. 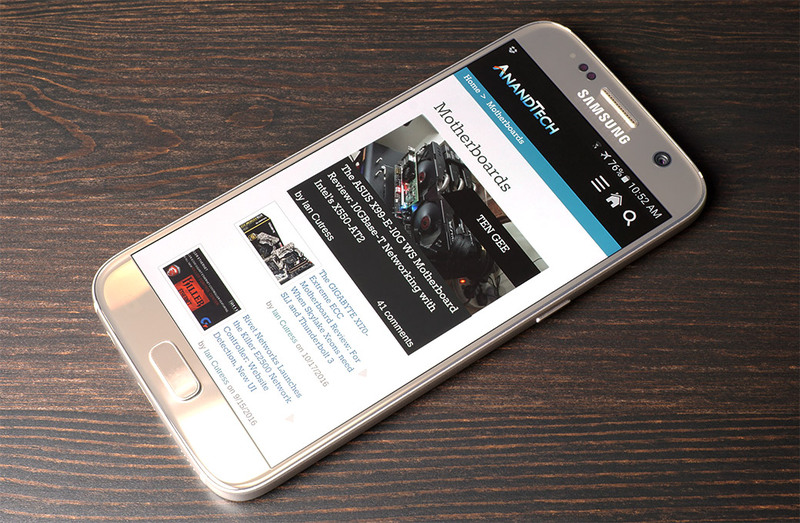 The Galaxy S6 was a good phone, but it was not perfect. The S7 addresses several of these shortcomings with a more ergonomic design, a larger battery, support for microSD cards, and the return of IP68 dust and water protection. The other phone worth discussing at the high end is the HTC 10, which manages to best the Galaxy S7 in at least a few areas. In terms of audio quality, design, OEM UI, and other areas like perceptual latency I would argue that HTC is just clearly ahead of Samsung. HTC also has proper USB 3.1 and USB-C support, which does make the device more future-proof than the Galaxy S7’s microUSB connector in that regard. The front facing camera is also just clearly better on the basis of having OIS and optics that can actually focus on a subject instead of being set to infinity at all times. However, Samsung is clearly ahead in display and its camera is clearly the fastest I’ve ever seen in any phone, bar none. Samsung is also just clearly shipping better WiFi implementations right now in terms of antenna sensitivity and software implementation, along with IP68 water resistance and magstripe payments for the US and South Korea. To further muddy the waters, there are areas where HTC and Samsung trade blows. While Samsung’s camera is clearly faster, HTC often has better detail in their images, especially at the center of the frame, but the Galaxy S7 has better detail at the edge of the frame. Noise reduction tends to be a bit less heavy-handed and sharpening artifacts are not nearly as strong as they are on the Galaxy S7. HTC’s larger sensor also means that it’s possible to get actual dSLR-like bokeh with macro shots, which is honestly something that I’ve never seen before in any smartphone camera. Overall, I think it’s pretty fair to say that the HTC 10 is a solid choice. If I had to pick between the two I would probably lean towards the HTC 10, but this is based upon personal priorities. I don’t think you can really go wrong between the two. 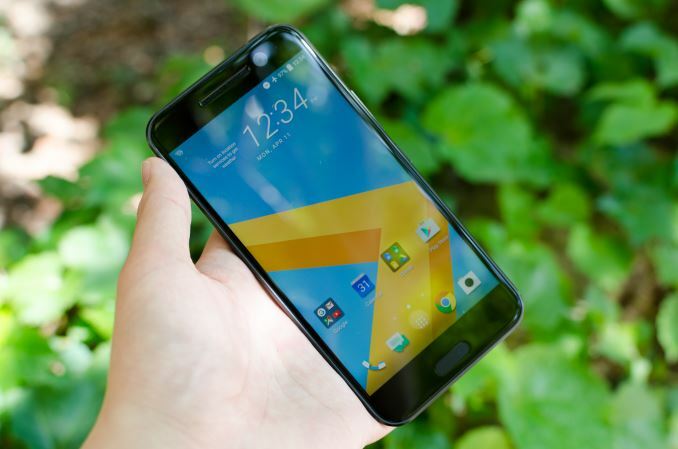 The HTC 10 with 32 GB of internal storage is currently $549 USD when bought unlocked through HTC and comes in Carbon Gray, Glacial Silver, Camellia Red, and Topaz Gold. The OnePlus 3, with its list of impressive hardware at a reasonable price, is still our (upper) mid-range choice. The Motorola Moto Z Play Droid is about the same price and includes a nice display, a good camera, and a large battery—not to mention support for Moto Mods such as the Hasselblad True Zoom Mod—but its eight Cortex-A53 CPU cores and Adreno 506 GPU cannot offer the same level of performance as the OnePlus 3’s Snapdragon 820 SoC. The Moto Z Play Droid also comes with less RAM (3GB), less internal storage (32GB), and lacks 802.11ac Wi-Fi. Its little brother, the Moto G4 Plus costs less than the OnePlus 3—$299 for 4GB of RAM and 64GB of internal NAND—but again falls short of the OnePlus 3’s overall user experience. Huawei’s Honor 8 is another contender that costs the same as the OnePlus 3 and is available in the US and internationally. It also has a smaller 5.2-inch display, giving it a smaller footprint than the OnePlus 3, although its heavily blue-tinted screen may turn some people off. General system performance is on par with the OnePlus 3, but its Mali-T880MP4 GPU cannot match the Adreno 530’s peak performance in the OnePlus 3. The OnePlus 3’s OxygenOS also does not stray as far from stock Android as the Honor 8’s EMUI skin, resulting in a very different user experience between the two phones, although which approach is better comes down to user preference. 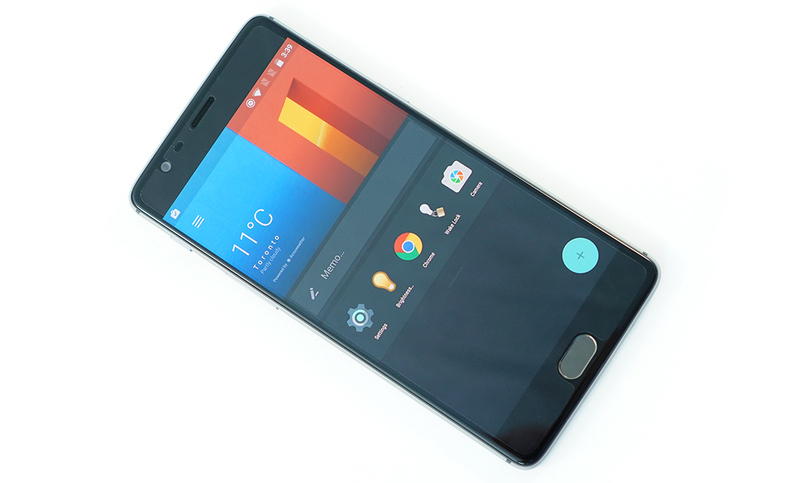 When we first looked at the OnePlus 3, Brandon discovered that the display’s grayscale and color accuracy were quite poor, its video quality was subpar, and it evicted apps from RAM too aggressively, especially considering that it comes with 6GB of LPDDR4; however, in subsequent software updates OnePlus has either fixed or improved each of these issues. The build quality of the OnePlus 3 is excellent, its 16MP rear camera with PDAF and OIS takes nice photos, and its Snapdragon 820 SoC delivers good performance. It also includes 64GB of internal UFS 2.0 NAND storage but no microSD slot, and the usual array of wireless connectivity options including NFC—something the OnePlus 2 lacked. The OnePlus 3 comes in only one configuration and costs $399. With a 5.5-inch 1080p AMOLED display, it could also serve as a less-expensive option for our phablet category, along with the Moto Z Play Droid. While the rest of the planet is awash with lower-cost phones containing decent hardware, it’s difficult to recommend a budget smartphone for the US market. 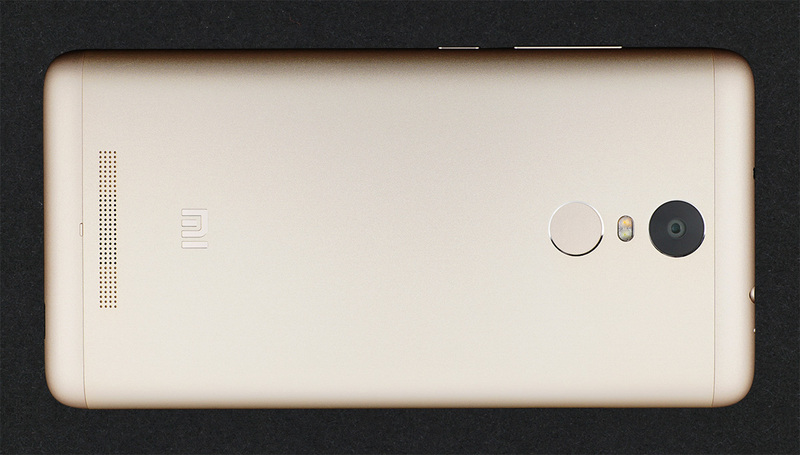 Take the Xiaomi Redmi Note 3 Pro, for example. Its Snapdragon 650 SoC contains two high-performance Cortex-A72 CPU cores running at up to 1.8GHz and four Cortex-A53 cores at up to 1.4GHz, which easily outperforms the standard octa-core A53 SoCs common at this price point. Its performance is really quite remarkable, rivaling some upper mid-range and flagship devices. The Adreno 510 GPU supports the latest graphics APIs, including support for tessellation, and is fast enough to play most games currently available. Battery life is excellent too, thanks in part to a large 4050 mAh battery. There’s even an infrared blaster and support for 802.11ac Wi-Fi and FM radio. Of course some sacrifices need to be made to reach such a low price. The Redmi Note 3 Pro’s weakest component is its 5.5-inch 1080p IPS display, whose poor black level and inaccurate white point and gamma calibration hurt image quality. The panel’s backlight does not fully cover the sRGB gamut, which further reduces color accuracy. While not perfect, it clearly moves the bar higher in this segment and raises our expectations for future lower-cost phones. Unfortunately, the Redmi Note 3 Pro, like most phones made by Chinese OEMs, is not sold in the US and does not support the LTE frequencies used by US carriers. Instead US consumers must choose from a number of underwhelming phones such as the LG X Power and its Snapdragon 212 SoC that uses four Cortex-A7 CPU cores—not even A53s—and 1.5GB of RAM. The Huawei Honor 5X cannot match the Redmi Note 3 Pro’s performance or photo quality, but it remains a solid option for the US despite being almost a year old. Even the recently released Moto G4 and G4 Play really do not bring anything new. 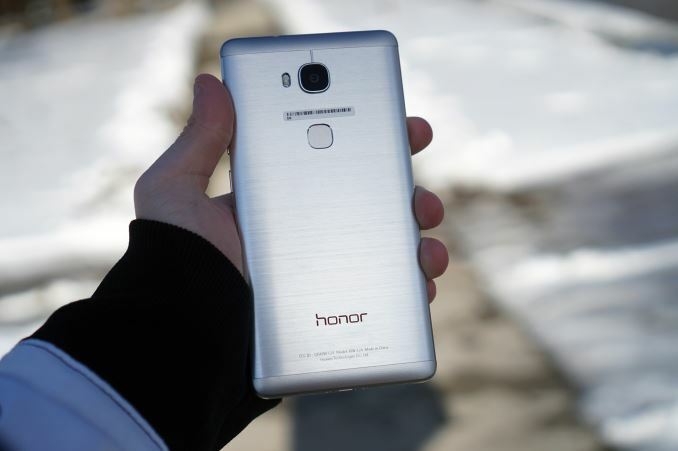 The Honor 5X recently received a long awaited update to Android 6.0 and EMUI 4.0 and is still available for about $200.